We offer summer camp opportunities to any Florida Child as well as Elk's children and grandchildren at a modest cost for one or two weeks. However, we don't turn away those unable to pay. Additionally, the camp is used year around by Boy and Girl Scout Groups and a wide variety of organizations dedicated to enriching the lives of children in general and underprivileged and disabled children in particular. For most children there is no cost. 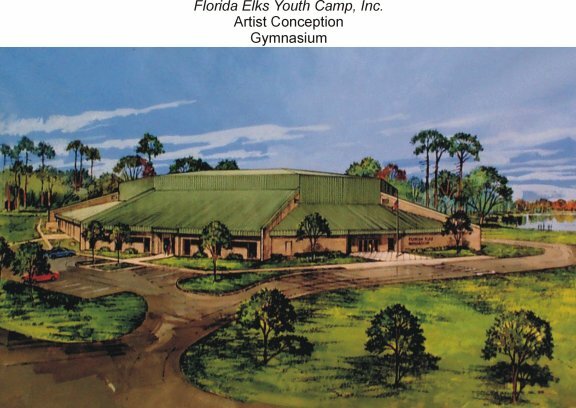 Located on 385 acres of rolling hills, forests, lakes and open space in Marion County, Florida, the Florida Elks Youth Camp is a facility Florida Elks take price in. It is a popular place for Florida's young people and thousands use it every year. The Florida Elks are proud that our camp is accredited by the American Camping Association and is re-certified every three years to assure compliance and a safe camping environment for children. The camp has a ratio of one counselor and a counselor in training to every seven campers. On no-name lake campers can take out a paddle-boat, canoe or just laze along the shoreline. There are several smaller lakes on the property and all are home to the famed Florida Largemouth Bass. Yes, fishing is allowed (catch and release). Just a few feet up the hill from the lake are the lodges featuring all of the comforts of home. Each of the Lodges sleeps nine, has heat and air conditioning, personal storage facilities, complete restrooms with hot showers and all are accessible to campers with physical limitations. Of course, many campers prefer "roughing it". Several primitive sites are available for tent camping and the campsites have hosted groups as small as ten and as large as five-thousand. The campsites overlook the picturesque no-name lake and have separate changing and shower facilities for boys and girls. Just a few steps from the cabins and the primitive campsites you'll find the 15-thousand square foot enclosed pavilion, which has been the center of the Camp. The pavilion, with full modern kitchen facilities, serves as the dining hall, game and TV room and nighttime and inclement weather facility. The pavilion can also be used to host large groups for seminars and meetings. The most exciting development in the continued growth of the Youth Camp is the construction of the gymnasium adjacent to the pavilion. The gym has three full length basketball courts, will accommodate 850 people in chair back seats and another 500 in portable seats. The gym includes conference rooms with satellite imaging and houses the offices of the Florida State Elks Association and the Florida Elks Hall of Fame and Museum. Just across the street, our Aquatic Complex consists of a 25 meter, 7 lane heated swimming pool with wheelchair access and adjoining restroom and shower facilities. Campers of all ages really give the pool a workout on hot summer days. Archery instruction continues to be a popular activity at the camp. Cut safely into the rolling hills is an eight position archery range enjoyed by all. The athletic facilities cover seven acres. Adjacent to the pool are the fenced tennis and basketball courts, each with first class surfaces. There are also sandpit volleyball courts, a golf driving range and miniature golf. The Challenge Ropes Course is rapidly becoming a popular activity. Participants are led through a series of games, activities and physical obstacles using both high and low challenges. The aim is to build confidence, self-esteem, trust in self and others, communications and problem solving through teamwork. The course is a hit, not only with youth groups, but also organizations interested in building teamwork and improving communication and trust among executives and employees. The educational complex includes large meeting rooms used by Elks groups for meetings and seminars and is available to other organizations. The complex also features 16 lodging rooms used by camp counselors and guests. Contact the Florida Elks Youth Camp at 1-888-367-3392 for further information.